Discussion in 'The York Rite' started by Blake Bowden, Feb 28, 2009. I this the costume for the Knights Templar in the york rite? Or the suit with the fuzzy hat? The cloaks you see in the first photo are more commonly used by our European Brothers. 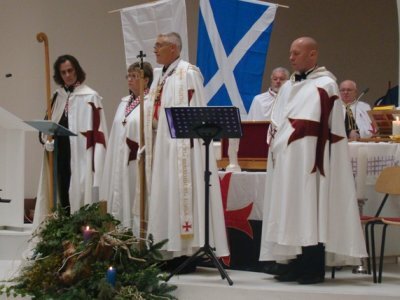 However there are a few Commandries here in the States that utilize the cloaks. Of course this photo appears to be of a Social Order of the Beauceant meeting of some sorts. The lower photo is the more common American Templar uniform. The first picture is almost like Knights of Malta but the Cross is black. Speaking of, it was a GREAT degree.